I decided to give up drinking a few months ago, and I think it’s been about 5 months now. I haven’t given up entirely and have a glass every few weeks or so, though even with a glass of front of me, I often forget to drink it. I seem to be losing the habit. I’m also losing the taste for red which worried me a wee bit. I always figured that I’d still like to have the occasional glass of red. I tried a favourite red ($20 bottle) in early July and was shocked to discover that it tasted horrible. It was like being 15 again and having a sip out of dad’s glass. Then I tried the private bin version ($40 bottle) of the same and it too wasn’t good. I was later relieved to discover that I did at least like the flagship wine ($60 bottle) from that winery. Whites are still mostly ok, and thankfully so is whisky. 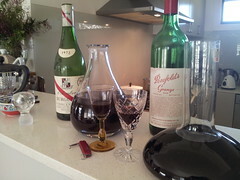 When I bought my place a few years ago, I also bought a bottle of Penfold’s 1990 Grange to celebrate. I was a little concerned that if I left it much longer, I wouldn’t be able to drink it. It was my birthday recently so I figured it was time to open it up. The cork proved challenging and had to be dug out in bits. The wine itself was fine and one of the better reds I’ve tasted. However it costs stupid money and while nice to do as a one off, I can’t see myself buying another. The surprise of the day however, was the 1972 d’Arenberg Burgundy. Dad gave it to me many years ago and he had been given it, along with a few other bottles, as a thank you for some work he’d done. It had been sitting in a barn for many years and was probably bought in the 70s. Everything I’d read about the vintage said it was decent but it was only good for 20 years or so ie til about 1992. It’s never been stored well, either in the kitchen of an old, fibro house or the occasional inner west terrace. The last few years it’s been stored upright. I fully expected this to be complete shite. Upon removing the wrapping, I discovered that the cork was soaking, and required careful removal. On initial taste, it was ok though a bit strong, smelling almost of port. Finally tried it several hours later and it was very yum. Utterly delicious and it may even have been better than the Grange though I don’t really trust my tastebuds these days. I had one of those 72 d’Arenbergs about ten years ago and it was an utter sensation. I’d love to be able to have one now. Sorry to hear you’ve given up wine. Now what?